National Socialist Tercios of New Castile (Tercios Nacional Socialistas de Nueva Castilla) was the name of a neo-Nazi organization from Peru which, according to the Internet Archive records from their website , was founded c. 2004. The name of the group combines the original name given to present-day Peru by Spanish conquerors with the name of contemporary Spanish military units, both referring to Spanish (i.e. "white") origins of their members. In 2008, they joined the National Socialist Movement "Peru Awake" (Movimiento Nacional Socialista Despierta Peru') to found the National Socialist Union of Peru (Unión Nacional Socialista del Peru'), which seems to have happened on Hitler's 119th birthday or a bit earlier , although their website was not defunct until the end of 2009 . Images of their flag were shown at their website  and elsewhere , but the only photo available on the Web is from the founding of the National Socialist Union of Peru . The flag was white, charged with a narrow red saltire, and over all a black cross, which is a combination of the cross of Saint James (bottom arm) and the arrow cross (other three arms). Red saltire on white is clearly derived from the Cross of Burgundy, while Saint James is the patron saint of Spain (hence the shape of bottom arm of the cross). The color set is that of the Nazi flag, while the arrow cross is sometimes used by the neo-Nazis (hence the shape of top and side arms of the cross). Breast patches patterned like the flag were used as the distinguishing marks on uniforms worn by the group members . Internet Archive Wayback Machine - records of the group website. 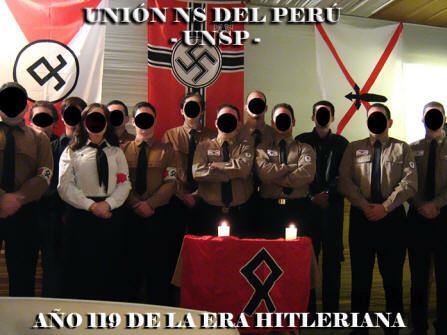 Photo from the founding of National Socialist Union of Peru. National Socialist Tercios of New Castile website at the Internet Archive. (Image). 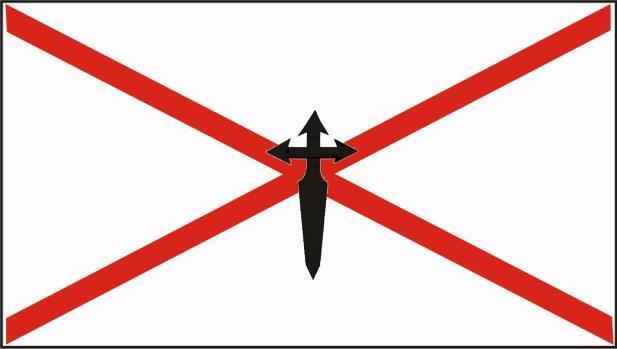 Animated image displaying the flag and incomplete name of the National Socialist Tercios of New Castile.